Dennis Di Lorenzo’s parents never went to college. They were blue-collar people who believed in hard work but not necessarily the hard work of higher education. “They didn’t see the value in it,” said Mr. Di Lorenzo, now dean of New York University’s School of Professional Studies. Neither of his siblings finished high school, opting to work instead. Although Mr. Di Lorenzo was a high-achieving student who scored well on standardized tests, his parents didn’t consider college a necessary part of his future. First-generation students mostly come from low- to middle-income families, are disproportionally Hispanic and African-American and have little, if any, information about their higher education options. As a result, they often have misconceptions and anxiety about attending college. 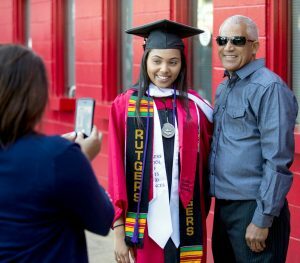 Yauris Hernandez, an economics major at Rutgers University who was part of its Future Scholars program, posing with her father, Carmelo, as her mother, Yris, takes their photo at graduation. College counselors can help these students deal with the complexity of the college preparation and application process. Yet few public high schools serving significant numbers of low-income and first-generation students have anywhere near enough counselors. According to the 2015 State of College Admissions report from the National Association for College Admission Counseling, counselors at public high schools are, on average, each responsible for 436 students, and those counselors spend only 22 percent of their time on pre-college counseling. Enter Aspire, a program Mr. Di Lorenzo created two years ago. It was influenced by a study of 20 public schools in New York City’s lower-income neighborhoods that found graduation rates suffering and a huge variance in college-readiness programs. Aspire aims to give students information about higher education, the application process and financial aid, and prepare them academically for the transition to college. The free, two-year program serves 40 high school juniors, who attend a weeklong program each summer at N.Y.U. There are also classes and workshops throughout the school year that offer leadership training, advanced math instruction, assistance with college essay preparation, and discussions about careers, scholarships and college majors. In addition, students are connected to a group of college student mentors. Mr. Peña still made it to class the next day. The program, he said, had a profound effect on him, and one instructor in particular was crucial. “He told us, ‘You can’t fly with the eagles if you’re walking around with the turkeys,’” Mr. Peña said. “That stuck with me. After that, I started really paying attention.” This fall Mr. Peña will attend Lehman College in the Bronx. About one-third of undergraduates in colleges in the United States are first-generation students, according the Georgetown University Center on Education and the Workforce and the United States Department of Education. Only 27 percent earn a college degree in four years, compared with 42 percent of students with parents who went to college, according to a report from the Higher Education Research Institute at the University of California, Los Angeles. Without a college degree, children of low-income parents are likely to be low-income adults, and their earning potential will only get worse over time. An analysis by the Georgetown center predicted that by 2020, 65 percent of all jobs in the United States would require postsecondary education and training. Rutgers University offers one of the few programs for first-generation, low-income students that support them all the way through college. The Rutgers Future Scholars program also starts earlier than most: seventh grade. In May, 75 students from the program’s first group of 180 selected in 2008 graduated from college. Of that group, 163 enrolled in college after high school, and 80 percent have either graduated or remain enrolled in some form of higher education. The Future Scholars program works with students from Newark, New Brunswick, Piscataway and Camden school districts in New Jersey who are considered “promising,” said Aramis Gutierrez, the program’s director. “We look for the ‘if only’ students, those who are on the cusp of doing remarkable things but need that additional support system in their life,” he said. Students are chosen based on academic performance and, just as important, involvement in their community and their school. The students receive academic support and enrichment, and mentoring from Future Scholars participants who are now in college. They attend classes after school, on weekends and during the summer. No student is ever expelled from the program for poor grades or lagging attendance. “We wanted to be something different, especially for young people living in communities that don’t give second chances,” Mr. Gutierrez said. If a student doesn’t show up to a Saturday class or an after-school session, or their grades have dropped precipitously, the faculty tries to address the cause of the problem and get them back on track. Ninety-seven percent of students in the Future Scholars program graduate from high school. More than half enroll at four-year institutions, the majority attending Rutgers, which offers them free tuition. About a third enroll in other four-year schools, and about 20 percent head to community college. A significant number of undocumented students are also in the scholars program; their college tuition is supported by private donors. First-generation students who graduate from high school but haven’t prepared for (or enrolled in) college can attend an N.Y.U. bridge program known as Access, which prepares them for college by providing academic remediation, tutoring and help with career development and job search skills. Students also earn 24 college credits that will transfer to a four-year institution. Aspire, Access and Rutgers Future Scholars are among a relatively small number of programs nationwide that target low-income, first-generation students. Some others are part of the federal government’s TRIO programs, which consist of eight different programs (like Upward Bound and Educational Opportunity Centers) that are also open to disabled students. This article was written by Eilene Zimmerman for The New York Times on June 7, 2017. College Perspectives Mentor Program, Inc.